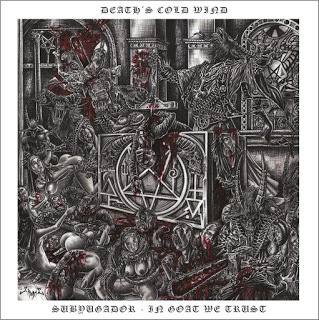 Founded back in 2001, Ecuadorian death metallers Death’s Cold Wind have been toiling around ever since trying to spread their vile sound to the masses as the outpouring of demos and split releases offered in the interim has honed them into a true South American killing unit. Finally able to offer their first professional release, the group’s full-length debut was originally released August 23, 2014 on La Medula Espinal with a June 2016 reissue on Old Temple. Once this one gets going, it’s quite apparent here that this one dwells quite heavily on the typical genre scene as the influences come through quite clearly. Efforts like My Hope (War.Ma.666.Dom), Gods of Depravity and Total Holocaust showcase the bands’ simplistic and furious charge, offering this one a rather strong and impactful series of swirling riff-work that shifts along plenty of frantic thrashing segments where the tempos feature plenty of variety. The ability to go from a feverish mid-tempo chugging to blazing full-throttle thrashing gives this a diversity to its attack that allows this one to switch through a multitude of approaches which makes for a far more engaging battle tactic. As this one tends to remain engaged in that approach for the most part on the album, it’s strikingly enjoyable and proficient at what it does although it tends to offer forth a very noticeable detail to hold it back. Due to the album containing simply retreats on the same dynamic formula throughout here, it’s a one-note approach that tends to feature a rather dynamic and intriguing tactic here of blasting through the raging speedsters augmented with mid-tempo work yet that’s really all that occurs throughout here. Normally, tracks like Necro Sexual Averrations and Death Terror would be highlights of the album, but they come across as more of the same here especially with the album being as overlong as it is. There’s little need for it to feature as much as it does here, especially being a debut feature which really highlights this issue even more. However, it’s not nearly as detrimental as it could be and remains a highly enjoyable slice of grim and ravenous death metal.